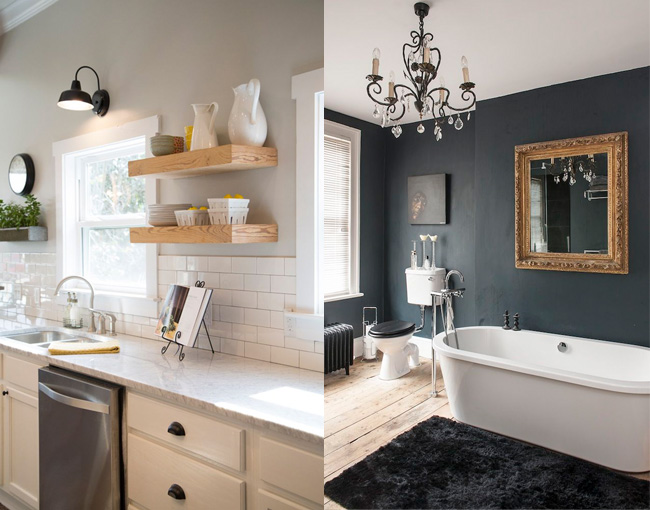 At the beginning of the year, there are always a bunch of articles floating around about the neat-o home trends we can expect to see over the next 365 days. Most of the time I enjoy them and agree with what they say, but I read one a couple of weeks ago that said grey is on the way out. I'm not even going to link to it because it will only ruin our collective day. It was so out of place among other things I'd read about how grey is the new black, so maybe the author was on cold medicine that day and a bunch of crazy talk ended up on their computer screen. I don't know. But in case you saw the same thing, I want to tell you that grey is here to stay. Remember how tan and beige were popular for a good decade (and definitely still work in some spaces)? That's grey now. It's extremely trendy but because it also has the advantage of being the most versatile neutral--meaning it can be a warm shade or a cool shade--it will never truly go out of style. Airy kitchen, meet glitzy bathroom. Most colors can go from tranquil to dramatic with styling and architecture, but what really gets me here is the intensity of the grey itself. It's hard to be bold without going over-the-top, but grey can do it. Just like it can be a whisper of color on the walls and countertops of a kitchen without totally fading away into nothing. Grey forever. I'm in agreement that when it comes to home decor, this is one color that is not on its way out of style. Period. In addition to writing for Bubby and Bean as our Home Contributor, Paige works as an Interior Designer (check out her biz, The Room Kit) and blogs over at Little Nostalgia. You can also find her on Facebook, Twitter, Pinterest, and Instagram. Grey can't be out - I refuse to accept it. 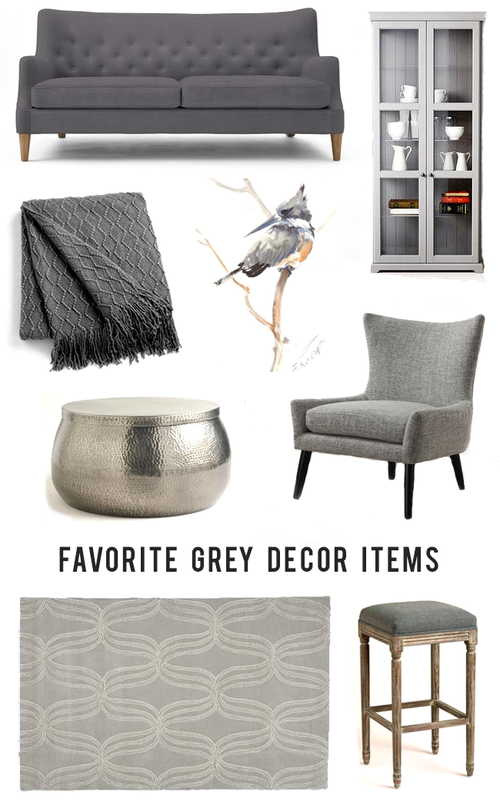 I'm crazy for grey pieces contrasting with whites. It's such a nice combination! I think I need that blanket and the rug. Grey is very much here to stay. I do love that bathroom. It has nice mix of light with the colors. Team Grey here! I love that bathroom! Love love love that sofa! Was surprised at the cost...that's a steal! Great feature here, M. Paige is da bomb! Love that cabinet from ikea (they have so much great stuff right now!). Totally agree with you about the grey. Lovin' the cozy gray blanket (it's COLD here -- again!). And love that charcoal bathroom.